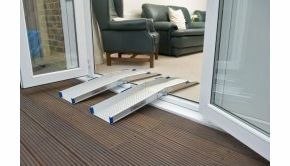 The Ultralight threshold ramp is a lightweight folding threshold ramp for wheelchairs and scooters which is ideal for use with steps, as a ramp over a threshold or for vehicle loading. 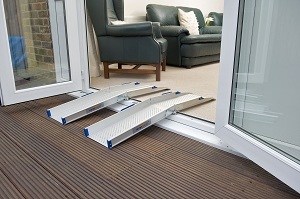 With a handy carry handle and a hinge allowing the ramp to fold in half, compact storage is possible and it is exceptionally simple to deploy. 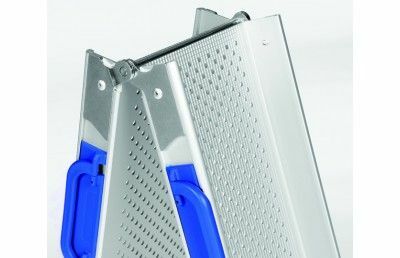 Made of anodised aluminium with a perforated surface, this is a perfect, corrosion resistant, strong, ultra light ramp with excellent grip. 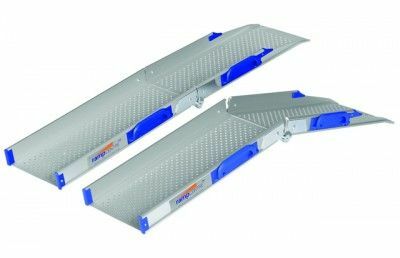 Available in 3 lengths; 110cm (3’7”), 150cm (4’11”) and 200cm (6’7”), this is a ramp suitable for almost any mobility needs.